The design of a clay cooker, also known as a clay pot, imitates the ancient practice of covering food with wet clay, roasting it in an open fire until the clay forms a hard shell, and then cracking the shell to expose the cooked food, likely losing most of the tasty juices at the same time. Today, clay cookers are far easier to use and are especially appreciated because foods cooked in them require little or no added fat. Some clay cookers are unglazed on the inside but all need to be soaked in cold water for about 30 minutes before using for the first time. As the heat of the oven permeates the pot, the wetness in the clay is drawn out, adding moisture to the cooker’s interior. Read the instructions that accompany your clay cooker before use. All clay cookers—even glazed ones—must be soaked—typically 30 minutes—before they are used the first time. To soak, slip the cooker into a sink filled with cool water. 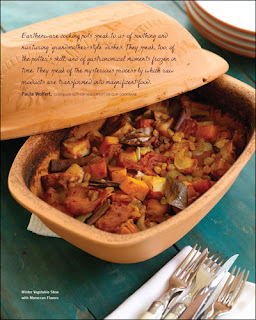 Some clay pots must be placed in a cold oven, which is then turned to the desired temperature, usually 400° to 450°F. Make sure to read carefully the instructions that accompany your clay cooker. Because the soaked pot adds so much moisture to the food, it’s the perfect vessel for making soup. Don’t take a clay cooker from a hot oven and place it on cold granite, tile, stainless steel, or another cold surface. Instead, place it on a folded kitchen towel to buffer it from extreme temperature changes. Wash with warm, soapy water and gently scrub with a stiff plastic brush. Use only mild dishwashing liquid, never strong cleaners. To remove stubborn burnt-on food or residual odors from the interior, fill the clay pot with warm water, add a spoonful of baking soda, and let stand overnight. It should then scrub clean. Always consult the manufacturer’s instructions. Dutch oven, cocotte, or braiser.